Columbia is well on its way to becoming a major center of interdisciplinary neuroscience work. As we reported in an earlier blog (Columbia Brain Research Institute Advances With $200M Zuckerman Gift), thanks to a $250M philanthropic gift, the University is in the process of constructing a state-of-the-art neuroscience facility. The Greene Science Center will house the Mind Brain Behavior Institute and coordinate the study and teaching of neuroscience across many departments and the various campuses at Columbia. 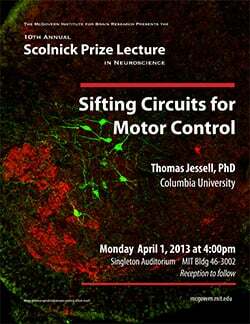 The university already has a long history of groundbreaking neurobiology research, exemplified most recently in the work of Dr. Jessell and acknowledged with the 2013 Scolnick Prize. The next stage will build upon that strength by opening up new collaborative and funding opportunities. For an example of how diverse neuroscience projects can be one from another, consider that another recent Columbia neuroscience news piece links to an NPR article reporting on Columbia neuroscientists who study what they call the "cocktail party effect," whereby the brain shuts out certain noises in order to focus specifically on one sound or conversation. Fascinating. Biotechnology Calendar, Inc. is a science research marketing and event-planning company that organizes university tradeshows nationwide. If you are a science researcher or lab supplier interested in networking with Columbia University Medical Center, our 3rd Annual BioResearch Product Faire™ event will be held on Tuesday October 1, 2013 at the Armory Track and Field adjacent to campus. Our shows are catered, casually professional, and always enlightening. See our full 2013 Nationwide Show Schedule for all other dates.